2017 was a window of opportunity for astute investors to enter the luxury market. After three years of “famine”, luxury home sales picked up and clocked a 48% increase from 2016’s volume to 433 units. The increase in volume was seen in all three categories of luxury homes: Good Class Bungalows (GCBs), bungalows in Sentosa Cove and luxury apartments (which LSIR Research defines as good quality and/or branded apartments in Core Central Region that are priced at $5 mil and above). The surge in sales could be attributed to pent up demand, positive market sentiment since the beginning of 2017 and more realistic price levels after three years of decline. Anecdotal evidence suggested that from Q2 2013 to Q2 2017, asking prices of luxury bungalows fell by 10% to 20%, bringing them down to more realistic levels. Another stimulus came from developers who need to offload their completed but unsold inventory of luxury apartments. To avoid or reduce the penalty due to the government for having to extend the sales period, they offered various financial packages and incentives to attract buyers. This brought the prices of luxury apartments down by around 15% from the 2013 levels. At the close of 2017, average prices of GCBs, Sentosa Cove bungalows and luxury apartments stood at $1,328 psf, $1,671 psf and $2,367 psf respectively. While prices of GCBs and luxury apartments seemed to be bottoming out, prices of Sentosa Cove bungalows are still under pressure. It was the opportune time for discerning investors who have been waiting at the side-lines to enter the market. Hence the pace of luxury home sales picked up, sowing seeds of confidence throughout the residential market. Through the year, 41 GCBs were sold, compared to 37 units sold in 2016. Although sales slowed down slightly in H2 2017 to 19 GCBs, the investment value was $403 mil, which works out to an average price of $1,442 psf, 16% higher than the $1,242 psf achieved by the 22 sales in H1 2017. The high land rate established in H2 2017 could be attributed to the record price fetched by a GCB at Cluny Hill. It was sold for $35.5 mil, at the highest land rate of $2,350 psf. The bungalow was completed in 2012, with a built-up area of 10,500 sq ft to house a two-storey building with a basement and an attic. The previous record was held by a bungalow at Bishopsgate which was sold in 2015 at $2,190 psf for its price of $33.0 mil. 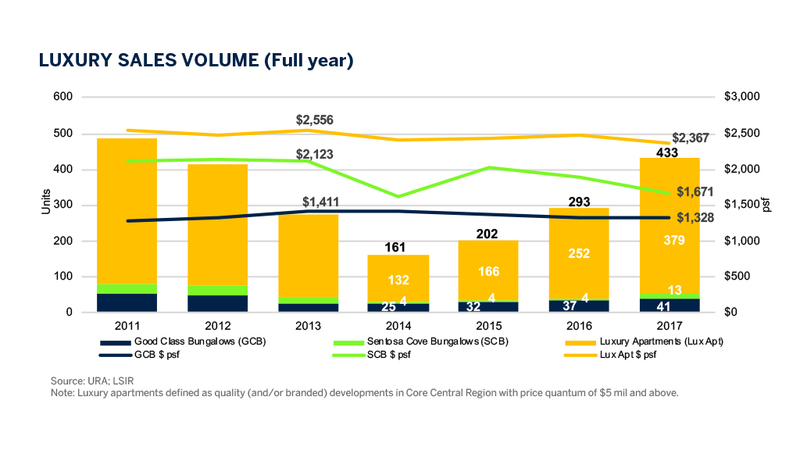 As at end-2017, the average price of a GCB is $1,328 psf, marginally higher than the $1,323 psf a year ago and 6% below the market peak in 2014. Response to the GCB market will continue in 2018. LSIR Research expects a similar number of GCBs to be sold and prices to see an upside of around 5% through the year. Bungalow transactions in Sentosa Cove jumped to 13 compared to only four units each in the preceding three years. 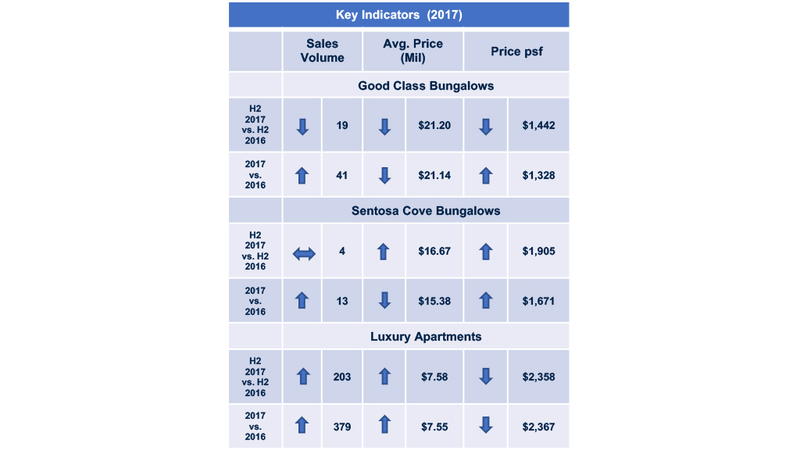 This shows that buyers are beginning to see value in the Sentosa Cove bungalows which have seen prices falling by over 20% from the peak in 2012. 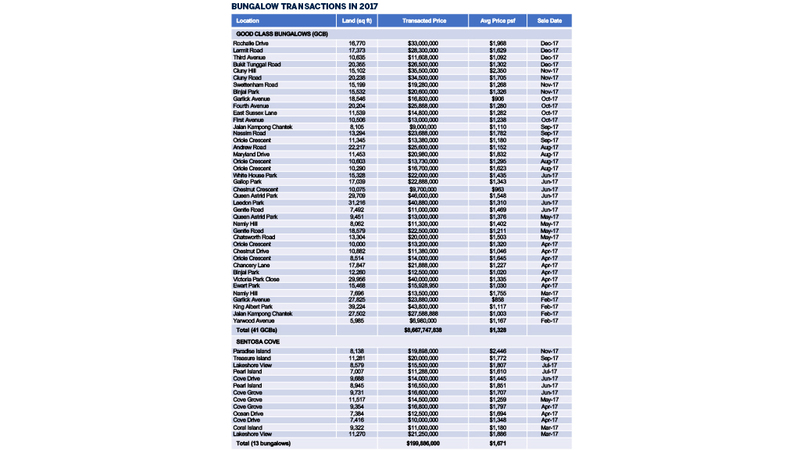 Four bungalows were sold in H2 2017 with a total value of $66.7 mil or $1,905 psf. In H1 2017, nine bungalows were sold for $133.2 mil or $1,574 psf. In total, the 13 bungalows reflected an average rate of $1,671 psf, 11% below the $1,881 psf level in 2016. A bungalow at Paradise Island was sold for $19.9 mil or $2,446 psf, the highest land rate achieved among the 13 transactions in 2017. The record price for a Sentosa Cove bungalow so far, was the $2,989 psf fetched by one located along Ocean Drive back in 2010. GCBs are restricted properties and only Singapore citizens are eligible for ownership. In recent years, GCB buyers tend to be families who are upgrading from smaller bungalows, Singaporean entrepreneurs in their late 30s as well as newly-minted high-net-worth (HNW) citizens. This group is likely to continue to support the GCB market. While foreigners are allowed to own bungalows in Sentosa Cove, the 15% additional buyer’s stamp duty (ABSD) is still a daunting factor to a foreign buyer. Based on caveats lodged, seven of the 13 bungalows sold were bought by Singaporeans and three were bought by permanent residents (PR), whose ABSD were 7% and 10%. Prices are likely to soften further in H1 2018 before they stabilise in the later part of the year. Some 15 to 20 bungalows in Sentosa Cove could be sold in 2018. 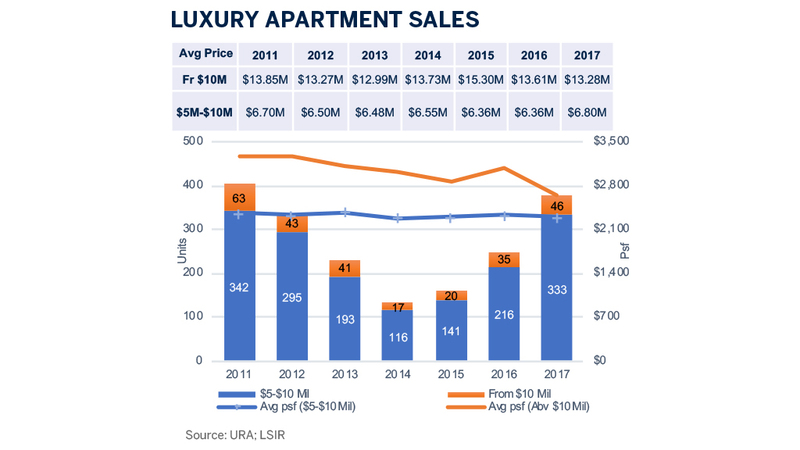 The luxury apartment market had a good run in 2017 with 379 sales, turning in the best performance in six years. At the average price of $2,367 psf, it is 7% below the market peak in 2013. Of the 379 transactions, 333 (88%) lie between $5 mil and $10 mil, and the remaining 46 units (12%) cost $10 mil and above. Most of the units in the latter category are large units (4,000-9,000 sq ft) which are either penthouses or garden suites of Le Nouvel Ardmore, The Nassim and Leedon Residence. 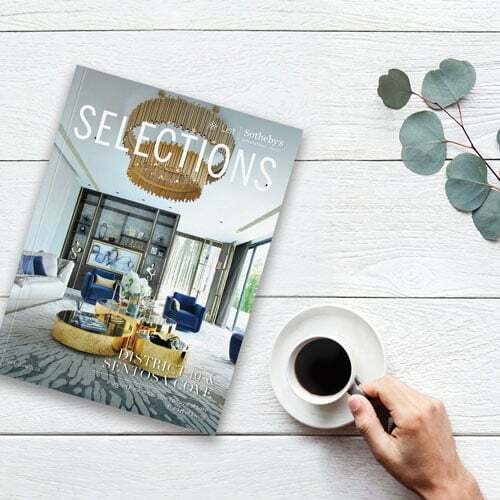 Based on caveat data, Leedon Residence took the lead with 76 units sold, followed by Gramercy Park and Ardmore Three with 70 and 20 units sold respectively. On psf basis, Ardmore Three’s units were priced from $3,360 to $4,440 psf as they were mostly above the 20th storey. The units in Gramercy Park fetched $2,500 to $3,050 psf and those in Leedon Residence fetched $1,550 to $2,500 psf. The priciest unit that was sold in the year was reportedly the 10,300-sq ft penthouse in Sculptura Ardmore. It was sold at above $60 mil or $6,000 psf. No caveat was lodged for this transaction. Of the 4,020 caveats lodged for non-landed transactions in the CCR in 2017, 1,977 (49%) were for properties below $2 mil, 1,664 units (42%) lay within the range of $2-$5 mil and 379 (9%) were luxury units priced above $5 mil. 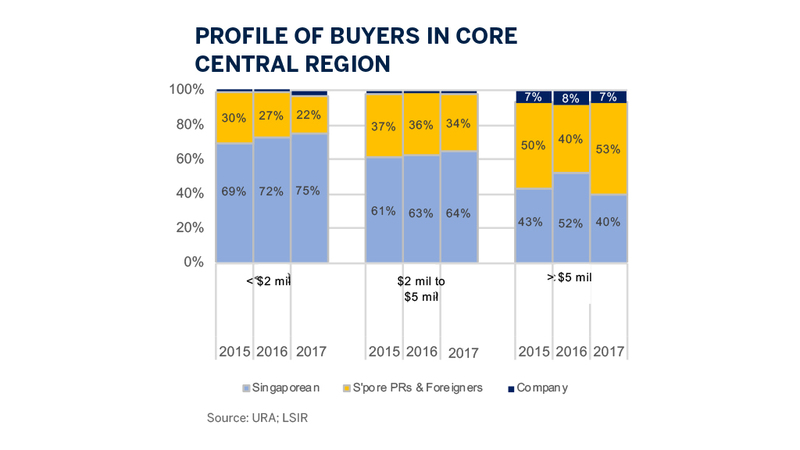 An analysis of the transactions in the three years from 2015 to 2017 showed that Singaporeans formed a 69 - 75% majority of those who bought units below $2 mil. Singaporeans also formed a 61-64% majority of those who bought homes in the $2-$5 mil range. However, in the luxury range, it was the foreigners and permanent residents (PRs) who over 50% in 2017 and 2015. This shows the foreign investors’ confidence in Singapore’s luxury segment and are willing to park their funds here. 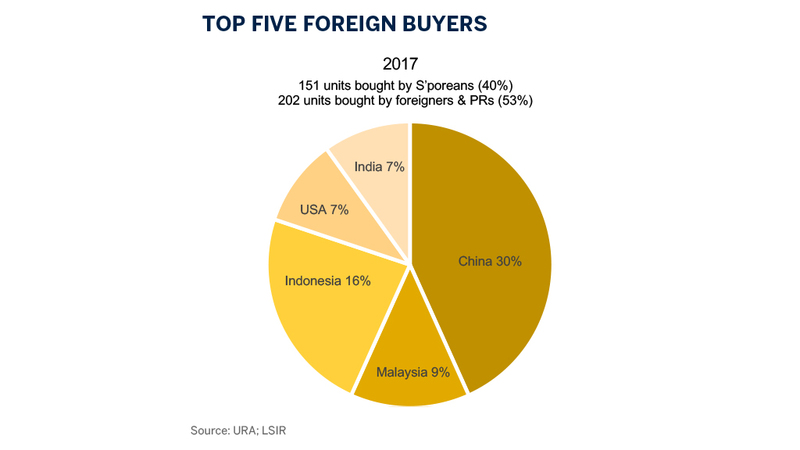 Among the various nationalities, the top five foreign buyers in 2017 were Chinese, Indonesians, Malaysians, Indians and North Americans, with the Chinese taking the lion’s share of 30%. That luxury homes is currently a good value proposition is undeniable because prices are still at attractive levels and the stock of luxury homes remains limited. Developers had eagerly stocked up their landbank in 2017 with nine sites located in CCR. However, it may take 12 months or more before some of these projects are ready for sale. As such, supply from the resale market will supplement the limited new supply. New launches in 2018 include New Futura, 3 Orchard-By-The-Park and South Beach. Luxury home sales could see a 10% improvement from 2017, with a 5-10% growth in prices.